The 2018 Return To The Remuda Sale will get underway at 11 a.m. (CDT) on Saturday, October 6th in Guthrie, Texas. GUTHRIE, TX—SEPTEMBER 4, 2018—The 2018 Return To The Remuda catalog is now available on line and available on the RGP App. 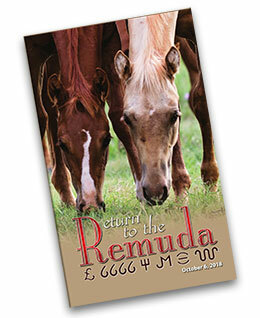 Hosted by 6666 Ranch, the 2018 Return To The Remuda Sale will get underway at 11 a.m. (CDT) on Saturday, October 6th in Guthrie, Texas. A demonstration will be conducted Friday, October 5th at 11 a.m.
Beggs Cattle Company, Four Sixes Ranch, King Ranch Quarter Horses, Pitchfork Land & Cattle Company, Tongue River Ranch and Wagonhound Land & Livestock, have consigned 153 horses to the 2018 sale. The sale is located 1 mile West of Guthrie on Hwy. 82/114 on the South side of the highway. CICK HERE to view the On-line catalog. The RGP Catalog App is available for both Apple and Android phones and tablets. A Catalog App tutorial can be viewed by CLICKING HERE. The free RGP Catalog App can be downloaded from www.robinglenn.com or by searching for “RGP Catalog App” in the Apple App Store. For additional sale information call the 6666 Ranch at 855.674.6773.